EVEN A CHILD CAN PAINT LIKE THAT! Well, to start off with, it was ENORMOUS - Picasso was the twentieth century Michelangelo. 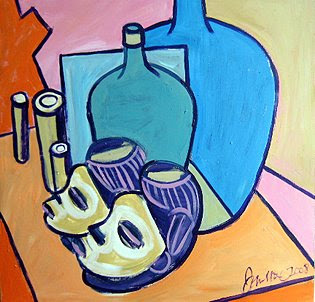 The pity is that every now and then one hears Picasso being denigrated. "One of my kids could have done that," is heard more often than one would expect. And it's nothing new. Here are some comments taken from readers' letters to The Guardian in 1947 following an exhibition in Manchester. "The bewilderment caused by Picasso's latest pictures indicates his failure to maintian his position as an artist." And: "The only sign of sanity in the dismal rooms was the disgust of the crowd." Well, at least they'd taken the trouble to look some of the paintings before commenting. This is not always the case. Anyone who thinks Picasso was a charlatan who couldn't paint and draw should have another look at his early work. Then consider what he said about himself. I've quoted this elsewhere on this blog, but here it is again: "It took me four years to paint like Raphael, but a lifetime to paint like a child." He also said: "All children are artists. The problem is how to remain an artist once he grows up." And finally, consider his influence on art - all art. Because it's quite hard to find any contemporary art (including advertising art) that has not been influenced by Picasso (or an artist who has been influenced by Picasso). If you're still not convinced, think about (or even better, look at) the art movements he started, influenced, participated in and usually dominated. Starting with traditional acadamec realism as a student, he quickly moved on to experiment with Post Impressionism, Fauvism, Cubism, Dada, Expressionism, Surrealism and then on to his individual and personal "classic abstractionism". At the beginning of the century there was an explosion of interest in anthropology and what was then called "primitive" art. And the very popular exhibitions of ethnic material culture had a decided influences on the Cubists. CONDOM? IT'S A TOWN? YOU MUST BE KIDDING! 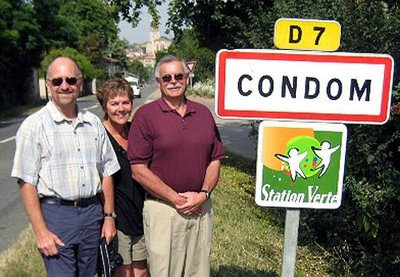 "Why ze Inglish always take zeir photo next to ze Condom road sign? ", asked Jacques, my petanque partner one day when we were playing boules in the village square behind the magnificient church of St Jean-Baptiste. He's right of course, all our guests want to have their photos taken at a sign with "Condom" on it. But explaining this to Jacques proved quite a task. The word "condom" for a contraceptive is meaningless in French - they use "preservatif". And where the very pretty river port town of Condom gets its name from is a minor local mystery. Some say it is named after a duke who had that name. Others prefer a difficult etymological explanation to do with the town's location on a river and near a hill and a Latin word that encompasses all these concepts. Condom boasts an Armagnac museum (more on Armagnac in a later blog), several good restaurants, and a wonderful cathedral that dominates the town. 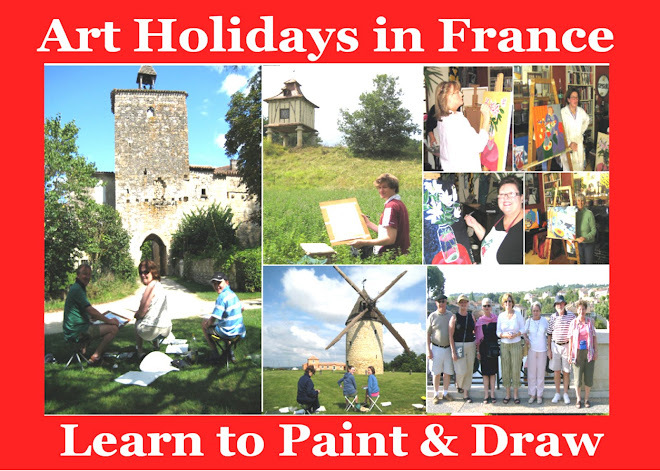 If you'd like more information on art holidays at La Petite Galerie in south west France (and perhaps have your photograph taken at a Condom road sign) please send us an email. Several years ago when I was young and stupid - well, middle aged and stupid, anyway - I went down the Franklin River in Tasmania with some friends. It's a great ten day trip in a World Heritage area, and once in, you can't get out or go back. (Except by helicopter in an emergency). 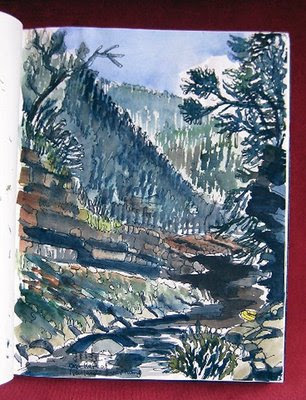 But we had a fantastic time and these water colours are to show you that there's never an excuse to leave home without your sketchbook. Even though my book and painting stuff had to have a separate waterproof container, it was well worth the effort. At one set of rapids we lost one out our three inflatable rafts - with everything in it. Luckily we managed to get the raft back again quite quickly - and for the next few days while rowing down the river, we kept picking up floating waterproof containers containing various items - including my sketchbook. So, although everyone's got photographs of the expedition, I've got my own personal and unique sketchbook diary. As Picasso said, "Painting is just another way of keeping a diary". 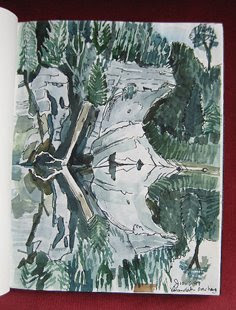 And it's always great fun looking back on the sketches and water colours I did on the trip. 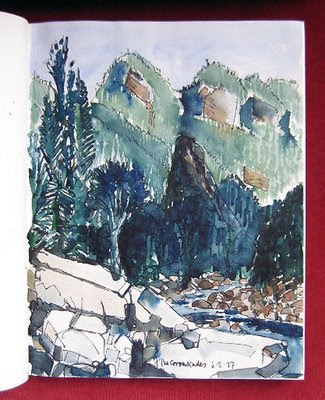 If you ever go down the Franklin River in Tasamania, remember to take your sketching equipment with you. And the same applies to wherever you go. DON'T LEAVE HOME WITHOUT YOUR SKETCH BOOK. YOUR BEST FRIEND - YOUR SKETCH BOOK -1. Benedictine Monks singing at dawn at Santo Domingo de Silos, Spain. 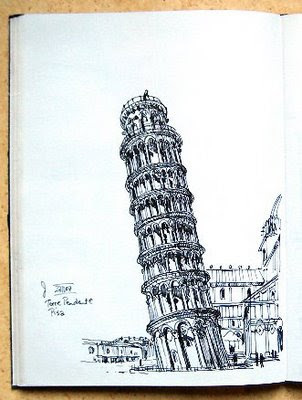 Pisa's famous Leaning Tower in Tuscony, Italy. Collioure on the Cote Vermeille, France. Question: What happens when a sportsperson stops competing for a while - and then starts again? Answer: The golfer looses his (or her) swing, the tennis player serves more double faults, and the sumo wrestler gets chucked out of the ring more often. The same detereroration of skills applies to a pianist who stops practicing. Or a ballet dancer who stops dancing. Or and artist who stops... Well, you get the message, don't you? Warning to artists: Stop sketching at your peril and prepare to lose your edge. 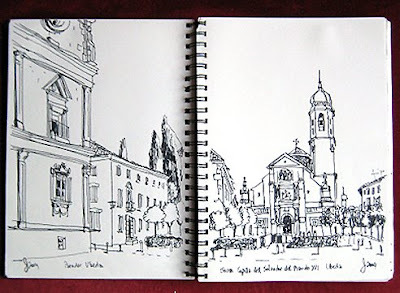 Sketching as often as you can will enhance your visual ability by helping you to identify art in everyday things. It will sharpen your dexterity. And it will improve your visual memory. More importantly, it will provide you with a wealth of sketches, drawings and ideas you can use to build into your more studied work. And it's a great visual diary. Now don't just sit there staring at this blog - start sketching! 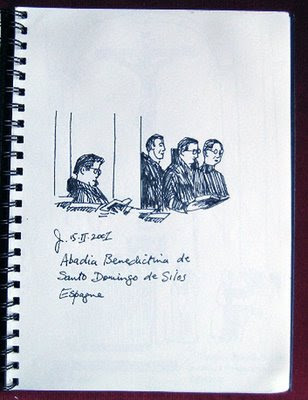 The drawings from my sketch book show how imposing subjects live side by side with everyday stuff. And they're all great fun to look back on. NO SKETCH BOOK WHEN YOU'RE AT AN EXHIBITION? GET THE CATALOGUE, AND FOLLOW THE FOLLOWING EASY STEPS. Step 1. Forget what you've told your kids about not drawing in books. Step 2. Check that the catalogue had a few blank pages. Step 3. Buy the catalogue. Step 4. Borrow a pen from a curator. Step 5. Find somewhere to sit. 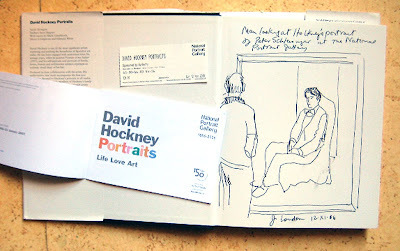 This is exactly what I did when I went to the Hockney exhibition in London a year or two ago without a sketch book. And this is a sketch (albeit not a very good one) of a man looking at Hockney's Portrait of Peter Sleisinger. If the man recognises himself from the back of his head and want's to buy his portrait by me, he should get in touch right away. The same applies to Sleisinger and Hockney. The countryside around Mezin, where we live, is literally peppered with places of interest. Several of the villages are officially listed in the guide book "The Most Beatiful Villages in France". Larresengle is just one of them. It's a tiny medieval village and it's so small that no cars can get through the gate - which is an arch through the walls - only pedestrians. We always take art groups to paint at Larresengle. Apart from painting, they always take lots and lots of photos. Their plan is to tell their friends about having had lunch in a medieval moat. It's always great fun to stand at the exact spot where a famous painting was done from. 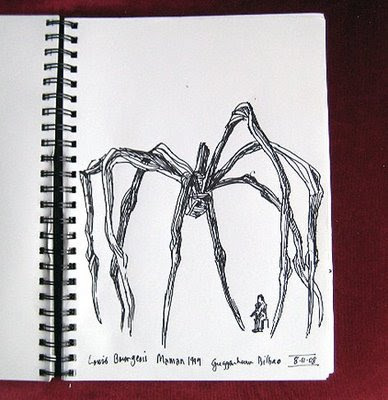 If you've got your sketch book with you it's even more exciting. You can put down your version of the same view that was seen by the artist when he or she was painting the original. Dali spent long periods of his life at Cadeques on the Costa Brava in Spain. However, the main Dali Museum is at Figueres, which is quite a way inland from the coast. If you go there in the summer, the queues are a nightmare, and, although, in my opinion, Dali produced some paintings that can only be described as amazing, he also, unfortunately produced quite a large body of junk. A lot of the latter seems to have found its way into the museum at Figueres, and I personally don't think worth wasting half the day queueing to see it. Dali's house is at Port Lligat, only a few minutes from Cadaques, and the house is now also a Dali museum. If you walk around to the western side of Cadaques to Port Alguer, you will find the view Dali captured in several paintings he did in 1924. 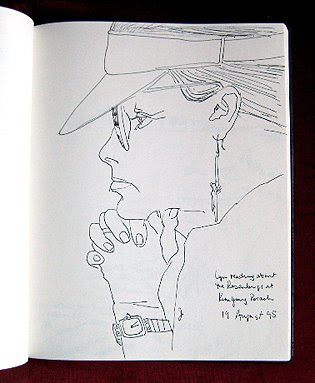 As you can see, I had a great time sketching the same subject a few years ago. St Jean-Baptiste in Mézin is a fine example of France's rich heritage of medieval church architecture, which ranges from small Romanesque chapels to great Gothic cathedrals. To coincide with a televised Mass, which took place in St Jean-Baptiste, I have put together an exhibition at the Tourist Office in Mézin called “CHURCHES OF THE SOUTHWEST”. I can see the church quite clearly from my studio on the third floor, and I have done several large acrylic paintings of the spire viewed across the rooftops of Mézin. 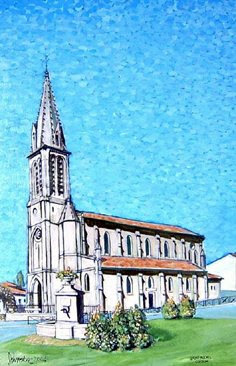 Many of the works in the exhibition are watercolours which were painted during the seven months that Lynne and I spent touring France in a campervan looking for a house, and there are examples of Romanesque chapels and churches from all over the southwest. 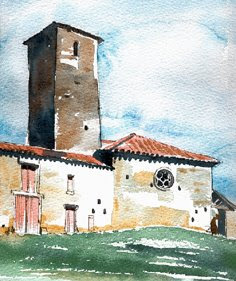 Several paintings are of churches that are on the Pilgrim's Route to Compostella which runs through Mézin. 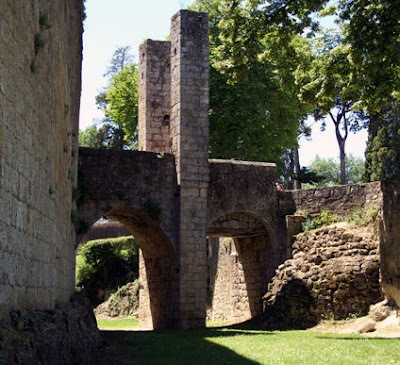 Each one is an historic reminder of the beautiful designs and ingenious engineering feats created by the architects, artisans and master builders of the Middle Ages. The exhibition, 'Churches of the Southwest', is on in the the exhibition space above the Tourist Office in Mezin. Entry is free. For more information please telephone: Renseignements 05 53 65 77 46. From time to time you need to stretch your creativity, technique and ability. So, if you like watercolour, try acrylic. If you enjoy drawing in pencil, get yourself a pen. You could experiment with scale - a large drawing is always a challenge. You could also choose a completely different subject - so, if you like painting flowers, do a self portrait. 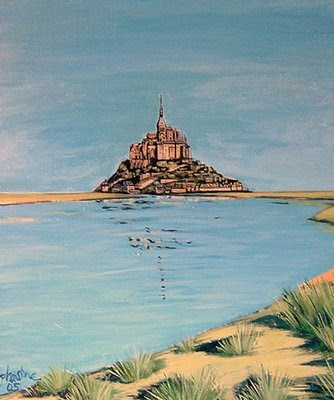 Or if you like painting buildings, paint a landscape. The options are almost endless. I was looking out my studio window one day and I realised that there were three separate views. 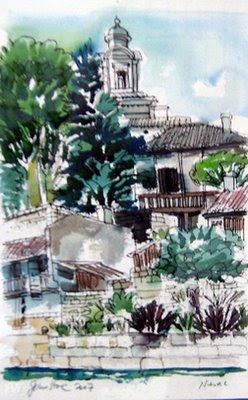 On the left I can look across the tiled roofs and medieval buildings towards the Church of St Jean-Baptiste. If I look straight ahead I see my nieghbour's roof and the village Marie - or town hall. Looking right, I can see down Rue Docteur Sourbes which leads the eye out to the countryside beyond. I did lots of drawings of these three views, wrestling with the perspective changes and developing them into one single composition which I did as a large scale triptych. The painting measures 2400 x 88 cms. WHICH ONE WAS DONE BY AN ADULT? One of the above drawings was not done by a child. Can you spot which one it is? Children are natural artists - until adults get hold of them that is. Unfortunately for kids, -and unless adults are very careful - they often become an inhibiting factor. "What on earth is that?" is not a good response to a young child's spontaneous and energetic scribble. Most parents will have noticed that young children will usually draw bold, large objects in the centre of a decent size sheet of paper. The result is invariably charming in it's spontaneity and freshness. So that's the key. Kids like to be creative on a large scale. The larger the better. If you won't let them draw on your walls, at least provide them with large pieces of paper. Strong, thick, bold felt tipped pens in various colours are also a good idea. Encourage them to always put their name and the date on the best pieces - the ones they may want to keep. (Old photographs bring back a flood of memories when we look at them - drawings done in the past can have an even more potent effect on our memories. And it's always great fun to look at old sketches). Unfortunately, friends, peers, older children, adults and even teachers can have a negative effect on this natural creativity. A snippet of advice for teachers: never, never start children off by saying things like, "To draw a human face, we start with an oval. Then we divide it in half and put the eyes on this bisecting line..." That's absolute claptrap. (I wish I could use a stronger word here, but I can't because Lynne will change it when she corrects my spelling). But the point is that this kind of advice will certainly stifle creativity. Formulae are for maths - not for art. Unfortunately, there is lots of this kind of art instruction around. But these "rules" are inhibiting, anti-creative, negative and rubbish. Avoid them at all costs. When discussing art with children, please remember that the idea is NOT to try to get them to paint or draw like adults. The objective is to get them to be as creative as possible when they transfer what they think or see onto a two dimensional surface. When looking at children's art, never forget what Picasso said about himself: "As a child I drew like Raphael, it took the rest of my life to draw like a child." So, which of the drawings was not done by a child? 1. Paul by Justin. 2. Amarillis by Lynne. 3. Car by Jack. 4. Queen by Yolande. 5. Fosters can by Paul. 6. Ray painting the Eiffel Tower by Tess. The answer is, my wife Lynne did the drawing of the amaryllis on a birthday card she did for me. TOUR DE FRANCE - ARMSTRONG'S BACK! We always make a point of watching Le Tour for at least one day every year. This means parking our campervan somewhere on the route the day before, and we usually choose an uphill section, when the cyclists will be going slowly (relatively speaking). It takes a lot of beating, a night in rural France on a warm summer evening, with the Pyrenees as a backdrop and having all our meals en plein air. Although the cyclists go by pretty quickly, it's a wonderful day's entertainment and a great spectacle because spectators start arriving with their banners and flags very early in the morning. And about an hour before the peleton arrives, hundreds of sponsor vehicles drive by, and most of them use the occasion to throw samples and promotional items - keyrings, caps, hats, T-shirts, pens and literature - into the throngs of people lining the road. Then the helicopters arrive and everyone knows that the contestants are just around the corner. 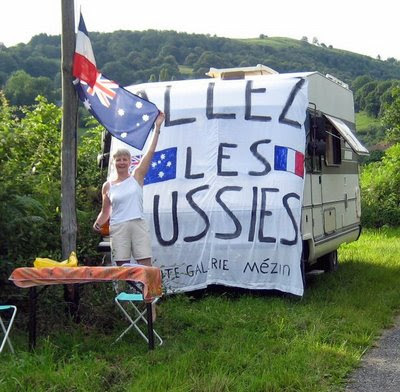 We always have a huge banner draped on our van to support any Australians in the race. And of course it's not over even when it's over, because we always watch that day's coverage on TV when we get home in the evening. The above painting of Lance Armstrong was a commission from Cary as a birthday present for his wife Becky, so it now lives on a wall in their home in Kansas City. Whether you are doing one for yourself or for a gift, flower paintings are always popular. Choosing the flowers, setting them up and deciding on the medium needs a little consideration. There are literally a million options, but here is what I recommend. Choose flowers with large, strong leaves and petals with simple shapes. I prefer a glass vase because I'm intrigued by the magnification, distortion and refraction of the stems below the water line. Your personal taste - or a painting you've seen - will help you decide on what you want to paint. However, here are some recommendations. Put the flowers in a vase on a piece of fabric in a strong light against a neutral background. The strong light will cast strong shadows which will make it easier to see the shape of the leaves, petals, etc. The neutral cloth will help the flowers stand out in your composition (rather than compete with what's going on in the background). 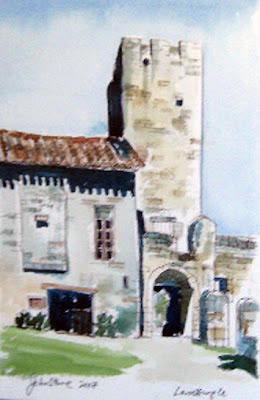 If you want a smaller, more intimate painting, why not try a watercolour on paper. These are quicker to do, usually smaller, and they're easy to post if you need to. Simply roll them up and send them in a tube. After you've painted your watercolour, try outlining the drawing with a black "keyline". This sometimes adds a remarkable element of integration. For a more studied work, use acrylic on canvas. Whatever medium, start with a drawing, which you need to do as accurately as you can, paying careful attention to the positive and negative spaces. (See other postings on this subject). With acrylics, try to prefer pure colours, mixed with white if necessary, wherever possible. (Mixing too many colours together will result in a degree of muddiness which means you may end up with a drab overall effect). 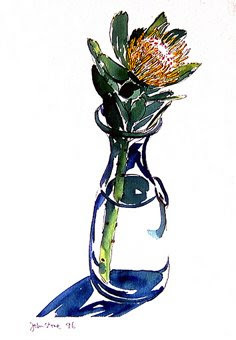 For ideas about what kind of flowers to paint, what style to paint them in and what medium to use, go to "images" when you do a simple search on the internet, such as "Flower paintings by famous artists". 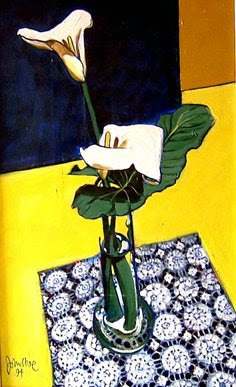 The top example is a painting in acrylic of flowers with large, obvious leaves and petals in a glass jar on a simple piece of cloth against a neutral background. The middle painting is painted with pure colours wherever possible. 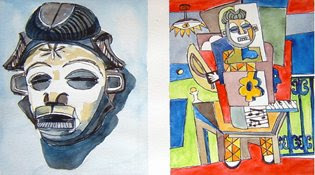 The bottom example is a watercolour, showing the effect of a black "keyline". GETTING STARTED - WHERE DOES ONE BEGIN? "Begin at the beginning," the King said, gravely, "and go on to the end: then stop." Lewis Carrol (1832-1898) Alice in Wonderland. Very good advice, but the real starting point for a good portrait is to draw as often as you can. This will sharpen your powers of observation and your dexterity when transferring what you see in front of you onto your paper or canvas. Perhaps the best person to start with is yourself. The advantages are that you are always available when you want a model. You can control the position of the model, what the model wears, and you can stop and restart whenever you want to. It is important that you emphasise the model’s features. This means that you must position the model in the available light to highlight the light and dark areas on the model's face. (See my blog on what Oliver Cromwell said about his portrait). Naturally the mirror you are using needs to be hung or positioned appropriately. I have tried to show how this can be achieved in the sketch above. The sunlight casts strong shadows across the face, and this helps to emphasise the three dimensional aspects of the face. Now you need to get started. Look carefully at what you see and try to reproduce the shapes you see in the mirror. Please, please remember that not all of your efforts will be an overwhelming success. But I can promise you that the more you draw and paint, the better you’ll get. Come on. Give it a go. In the sketch above, A is you, B is your mirror and C is your self portrait. The other two paintings are portraits of Lynne I’ve done over the years. I love doing a portrait exercise with the kids who come to La Petite Galerie. I sit them down opposite me and take them through the process step by step. When we come to my forehead, I ask them to put in the wrinkles. This always embarrasses them. They’ve been taught that wrinkles are bad news. Their mothers probably spend fortunes on anti-wrinkle products. I have to explain to them that wrinkles give the face it’s character. They are the lines that cartoonists use so effectively to create a likeness. Once they’re relaxed about emphasizing my wrinkles, crows feet, the bags under my eyes and my flabby cheeks, they invariably come up with a credible likeness. In the above paintings, you can see that even I had hair once - Self Portrait 1978. 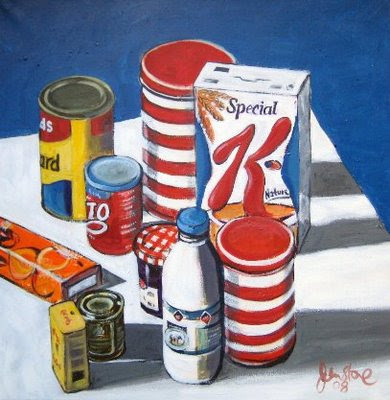 The other paintings are a portrait of Lynne - called "Are You Ready Yet, Raymond? ", which I did in 2008 - and a portrait I did of a Blind Man in Australia in 1992. For details on the more practical aspects of portrait painting, please see Portraits 2. * ARMAND FALLIÈRES? WHO'S HE?